Reminder! Duna and RT Rotisserie Are Now Open! 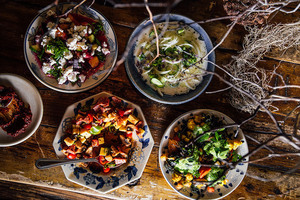 Chopped salads at Duna. Photo: Eric Wolfinger. A look inside the new RT Rotisserie. Photo: Kassie Borreson. I have been sharing details about these two projects, but since they both officially opened while I was traveling, I wanted to be sure you had them on your radar. First, the latest project from Nick Balla and Cortney Burns, ~DUNA~, is now open in their former ~MOTZE~ space. Take a look at the Central European menu here, with a fast-casual format that makes it an easy one to swing by for. I’m so ready for chopped salads and flatbreads! Liptauer paprika cheese dip is also going to be a friend, I can just tell. Open Wed-Fri from 5:30pm-9pm and Sat-Sun 5:30pm-10pm. Lunch service will launch later in the summer. Also, check out their Father’s Day menu (scroll down), it looks great. 983 Valencia St. at 21st St., 415-484-1206. 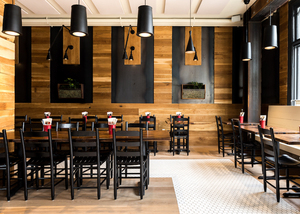 Now open in Hayes Valley is ~RT ROTISSERIE~ from Rich Table’s Sarah and Evan Rich. 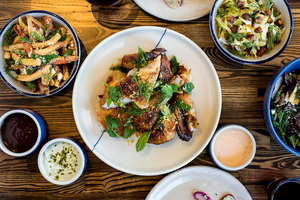 They’re slinging rotisserie chicken, pork, and cauliflower, with a bunch of sides, all sourced with care and featuring their trademark layering of flavors. It’s perfect to dine in (there are 46 seats) or take out (or delivery—nab it on Caviar, and use my code in that link for $20 off!). I ordered a half chicken and their kickass salad for deadline delivery, and it hit the spot. Check the menu here, and you can catch up on more details here. They are now open for lunch, so you can easily nab a sandwich (on housemade Dutch crunch!) or salad. Open 11am-9pm daily. 101 Oak St. at Franklin, 415-829-7086.